On part 1 of this series I blogged about our fortuitous sighting of the very inconspicuous Alpine Appleberry (Rhytidosporum inconspicuum) at Middlesex Plains, 16 Dec 2008. Our next stop was the Vale of Belvoir. 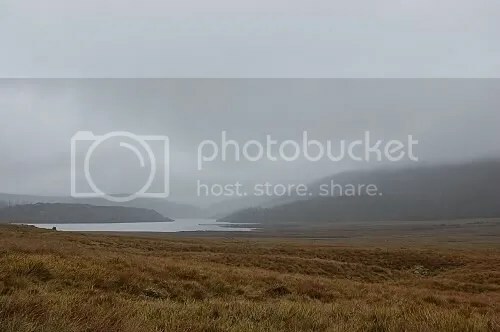 The Vale of Belvoir is a breathtaking place, even in bad weather. Eminent ecologist Jamie Kirkpatrick says that the securing of the Vale of Belvoir as a conservation area was a major triumph for Tasmania. If you’d been there you’d agree. The area was full of sedges and other alpine forbs, some of which I seeing for the first time. Our quarry at the Vale of Belvoir though, was the Alpine Candles (Stackhousia pulvinaris). In addition to Tasmania, S. pulvinaris also occurs (not commonly) in high altitude areas in mainland Australia. In Tasmania however, it only seems to occur in the Vale of Belvoir area, thereby explaining it’s ‘Rare’ status under the Threatened Species Protection Act (TSPA) schedules. Upon sighting individuals of S. pulvinaris, one questions the sense of the name ‘candles’. Candles is the name given to members of the genus Stackhousia in Tasmania, probably alluding to the inflorescence of spirally arranged white, yellow or cream flowers, giving the overall effect of ‘candles’. The common Stackhousia monogyna is a fabulous example of this. S. pulvinaris on the other hand has no such inflorescence. 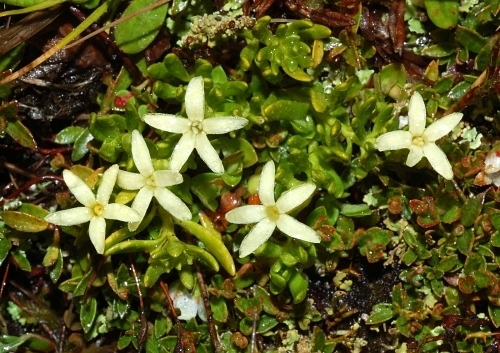 The flowers occur singly in the leaf axils and unlike it’s cousins, has adopted a mat lifeform, a common strategy of plants growing in alpine environments. After spotting the first individual, practically right at the start of the track, we were greeted by numerous others, all smiling in flowers. Almost all these plants were along the track, as if they liked the anthropogenic disturbance. In total, we estimated over 100 individuals just along a few hundred meters of track. All in all, I’d say that the population of S. pulvinaris is in good health – a very positive sign. Plants aside, the Vale is a stunning place (I just had to say it again). Definitely a place I’d want to return to in the future. This entry was posted in Fieldtrips, Threatened Plants and tagged Alpine Candles, Stackhousia pulvinaris, Stackhousiaceae, threatened species, Vale of Belvoir. Bookmark the permalink.